Obviously the 'encirclement rule' still applies. These two rules are simple and utilise the board edges, so that the only way a draw can be done is by using the spaces left open when Black tried to block the corner, rather than hindering Black's blocking the corner because otherwise he is likely to lose by an edge-fort. InterEsting post from Evans. I need to give it some more thought before a proper response, but one thing important to consider that you've not mentioned is compensating white for the loss of leverage when one removes perpetual check. Thanks Evans for your post and your statistics. I'm not qualified enough to respond to everything you said in it, but I think that the notion of both players having the same methods of winning or at least the same number of methods is rather a "philosophical" matter. At least for me, if the game's balanced (and if it is a lot of fun), I don't care what the exact relations between the one and the others player's targets are. Now, if there's an unbalance (as you said, I think that it is too early to claim that right now, yet white in tafl games seems to have an advantage between "unexperienced" players as we all are momentarily), that would be a valid reason to re-think our ruleset. Hi Evans and everyone, have had some thinking time about this now. Evans wrote: in a balanced game, no player should have any leverage over the other than the goal, and Whit getting an extra goal is unfair. I would suggest that leverage can come from other places, for example threatening the queen in chess can give powerful leverage. But I think I understand what you are driving at. White has only one goal, to get the king to leave the board, black has one goal, to capture the king. In Fetlar this manifests as one goal with four possible exits to choose from. Could be called four goals. Certainly white often uses two pronged attacks to win. But building an edge fort exit for the king is of course a new way of leaving the board. But I agree with Roderich that if this makes the game more fun, while being balanced and elegant, that's fine by me. Besides, black also has the extra goal of surrounding all pieces. 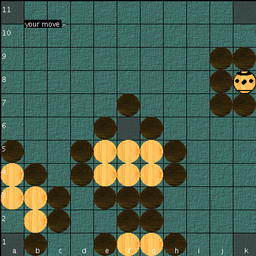 Evans wrote: When White is attacking the corners, Black can no longer place pieces at the corner, and those blockades using only the necessary 3 pieces are hardly possible anymore. Here I am inclined to agree that we may have a problem. My test games with crust are hinting that it may be too easy to split open an edge by attacking two adjacent corners. But if this is the case, then making it a draw or a win makes no difference, it will still be unbalanced. But as the strategies are so new we have to play it out some more to know. Certainly black has to be even more creative and economical than usual. 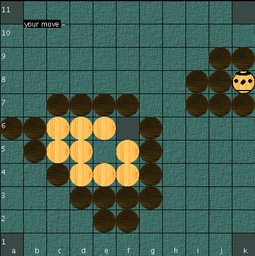 Evans wrote: White now has essentially the winning conditions of corner Tafl and edge Tafl. 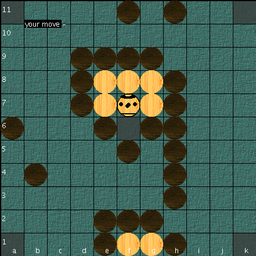 This I don't agree with, I concede that all edge squares become potential exits, but the conditions for setting up an edge exit with a king mobile fort make it a world apart from edge tafl, where the king must be hemmed in at all costs, leading to enormous leverage for white, hence the weaponless king. Black does not have to worry about the edges in the same way at all in copenhagen. But they do have to worry about allowing edge forts being built. Here we can see the imbalance of the current Copenhagen rules, although certainly we will glean a better idea once the tournament has been completed. Again I must disagree. Its far too early to say that we can see the imbalance. An imbalance yes, but nothing like enough evidence to condemn or confirm these rules. Add to this the fact that all games completed before rule +3 was introduced must be considered a separate experiment, that all games that were unfinished when it was introduced are unuseable as clean data, and that only games started after the introduction of rule +3 can be used as clean data for that rule set, and you end up with statistics that are at best unreliable and at worst meaningless. But the tournament is still useful, we are roadtesting the rules, and getting a feel for them and its generating good discussion! It certainly makes things simpler and easier to test! Hagbards previous post had another suggestion for fixing the two man edge draw fort problem. But I am tempted by the simplicity of the rules you suggest. Personally I don't quite feel ready to throw out the edge fort exit concept, and I'm enjoying them very much in gameplay. Making them a draw position would make them far less satisfying for both sides. But it may be that your suggestion proves neccesary to retain game balance. I for one certainly don't want to go down the route of handicapping the king to adjust the balance. I suppose the absolute simplest solution would be simply to forbid all board repetitions, forcing an alternative move on the third move, but at the loss of the draw fort entirely which I think we all agree adds a good deal of variety and personality to the game. "Capturing by Using the Shieldwallrule. If there is the same number of opposing taflmen in a row in front of a row of taflmen the whole group can be captured at once by bracketing them." Using the shield wall rule on the above position, the white pair on the edge is captured, and rest of the whites are in a position of simple encirclement covered by rule+1. Last edited by Hagbard on Mon Apr 30, 2018 8:36 pm, edited 2 times in total. Hagbard wrote: It seems that our encirclement rule+1 got out into the wild already. I wonder if we have readers on the forum from Salisbury in UK? Very interesting Hagbard, I think it might be an example of convergent evolution. They presumably had the same arguments we had, and came up with Copenhagen rule #1 independently to deal with the centre-fort problem. I like the way they put it: "If the light pieces encircle the king and all the remaining dark pieces, they win; for although they may not be able to prevent movement inside the circle, they prevent the king from escaping and so achieved their aim." That makes it pretty clear they were targeting the centre-fort draw! 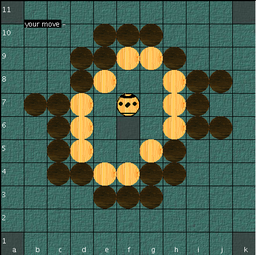 There are some good ideas there about how to present the game to younger players, though I can't help feeling they would be better off teaching them sea-battle tafl. Congratulations Evans on first recorded use of "garbo" as a verb. White may achieve a draw garbotically with a garboed king. I must tell Shaunyman, who discovered it, as I recall. Hagbard wrote: As mentioned before, it's easy for white to go for this position [centre fort with two men at the edge]from the start in order to force a draw, so this can be abused. Sorry - am I missing something here? I really don't see it is all that easy to establish a two-man edge-fort. In which case the centre fort with two man edge fort position is not an "easy" draw, just a draw. Would anyone care to test this out with me? You can play white, and I will resign if you get a two-man edge fort. Prove me wrong! The proposed rule #4 which deals with this situation seems a step too far. But I could be wrong of course. 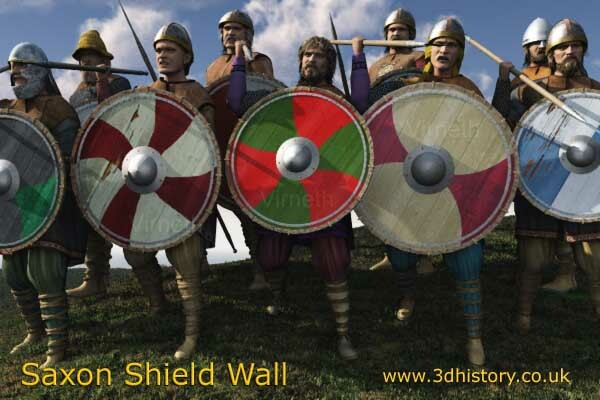 The shield wall rule is interesting - good research Hagbard! - but I don't think it adds much, as you already pointed out, it doesn't prevent a two-man edge fort next to the corner anyway, so I don't see that it helps solve a problem that I don't think is a problem (see above). The shield wall rule might be interesting to try though, but let's not cloud the waters too much just yet! Yes, thanks Evans, your contribution is extremely valuable - where have you been all this time. Roderich, you are well qualified! Adam and I are playing strong copenhagen games over on dragonheelslair: so far I would say black wins slightly more often than white - certainly not a white walkover like evans' statistics would suggest. Oh how I wish we could all meet up in a pub! (for a pint of Strong Copenhagen)... Fraternal greetings to you all. There is a simpler way of turning these situations into black wins: if the king can be captured on the board edge, black won by simple capture of the king. 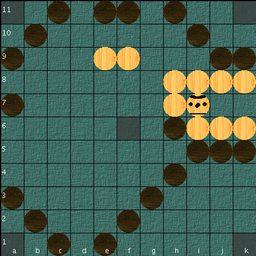 If a row of pieces can be captured against the board edge through the shield wall rule, it follows naturally that so can the king. In chess, which is another very old battle game, the king is captured against the board edge. As for balance, Evans counted for the Copenhagen tournament 65% white wins and 35% black wins. Counting all Copenhagen games together so far, both tournament and non-tournament, gives 18 white wins, 11 black wins and 1 draw, so the king doesn't really need this privilege (only full matches counted - A plays white against B and A plays black against B). The English page http://www.manaraefan.co.uk/index_files/Page5204.htm has a good wording which could be taken as a principle: "If the black pieces encircle the king and all the remaining white pieces, they win; for although they may not be able to prevent movement inside the circle, they prevent the king from escaping and so achieved their aim." Board edge king capture would be a good way of handicapping the king if we find it is needed. Though I hasten to add that if that includes corner capture with two men and a corner refuge, then I'd consider this a rather severe handicapping. Removed perpetual check is already giving the king a much harder time at the corners in strong copenhagen. I am beginning to lean towards an 'extra strong copenhagen', whereby all repeated board positions become illegal on the third repetition, with the exception of a mobile king edge fort exit, which results in a white win. 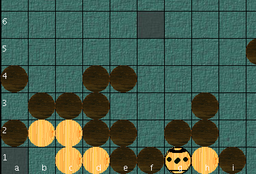 Some drawfort positions can still be utillised to force black to divert forces to round up stray men, forcing mistakes and so on, but cannot be used to end the game in a way only available to white. This way, black has to do their job properly, working hard to immobilise and destroy white soldiers without letting the king escape, but white have to do their job properly, getting the king out. But by keeping the kings edge exit fort, we retain a good deal of the extra dynamism that fort building has brought to the game, while doing away with the disatisfaction of a draw, and the problem of a draw available only to one side. Seems like a reasonable compromise to me, providing it balances of course. I like the shieldwall rule, great fun. Excellent for mopping up stray soldiers! Presumably it only works when slotting the men in at the sides, that is to say, not just by completing the face of the wall? I agree with Crust that its something worth looking at if it really becomes needed. Adam wrote: I am beginning to lean towards an 'extra strong copenhagen', whereby all repeated board positions become illegal on the third repetition, with the exception of a mobile king edge fort exit, which results in a white win. Sounds like an idea; and possible to implement, too. Adam wrote: I like the shieldwall rule, great fun. Excellent for mopping up stray soldiers! Presumably it only works when slotting the men in at the sides, that is to say, not just by completing the face of the wall?